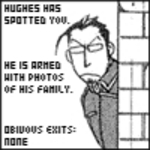 Maes Hughes: Armed and Deadly. He is armed with pictures of Elysia... RUN!. Images in the फुल मेटल ऐल्केमिस्ट club tagged: fullmetal alchemist maes hughes lol. HA HA HA HA HA!!! RUN EVERYONE!!! RUN! !